CONSIDERABLE: Areas with dangerous avalanche conditions exist on drifted upper and mid-elevation slopes. Beware of large unstable cornices and slopes overloaded by wind drifted snow. Dangerous human triggered avalanches consisting of wind drifted snow and failing on a buried persistent weak layer remain likely in some places. You can find safer conditions and nice powder at lower elevations, in sheltered terrain, and on lower angled slopes. Dangerous conditions exist in drifted upper and mid-elevation slopes, but you can find nice snow and safer conditions at lower elevations, in sheltered terrain, and on lower angled slopes. Drifting was significant over weekend from strong south winds. 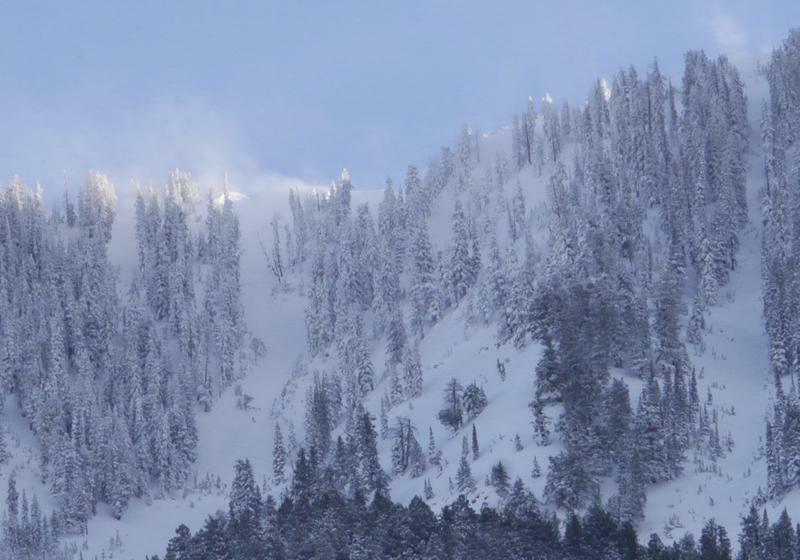 The Tony Grove Snotel at 8400' reports 7 inches of light snow from yesterday, with .4" SWE. It's 5º F this morning and there's 76" of total snow containing 97% of average SWE for the date. It's -2º F, at the 9700' CSI Logan Peak weather station. West winds are currently averaging around 26 mph, with gusts around 36 mph. High pressure moving into the Great Basin will bring dry conditions to Utah through early Wednesday. The active weather pattern will return to northern and western Utah for the latter half of the week. Today in the Logan Zone, it'll be windy and mostly cloudy in the mountains, with 2 to 4 inches of snow possible. High temperatures at 8500' expected to be around 21º F, and increasing west-southeast winds, 26 to 31 mph with gusts around 45 mph. Wind chill values of -11º F. Tonight, temperatures will be around 14º F and 23 to 30 mph west-southwest wind with gust of 44 mph will cause wind chills around 12º F below zero. It'll be mostly sunny tomorrow, with high temperatures around 25º F and 22 to 24 mph southwest winds, with 40 mph gusts. Dangerous conditions exist on drifted upper and mid-elevation slopes. Human triggered avalanches, 1 to 3 feet deep and large cornice falls are likely today. Cornices are likely to break much further back than expected and could be quite large. You could encounter fresh, soft wind slabs or stiff harder old drifts that allow you to get out on them before releasing. Avalanches and cornice falls are most likely at upper elevations on slopes facing north, northeast, and east, but possible on many upper and mid elevation slopes. Avalanches of wind drifted snow could fail on a buried persistent weak layer. Frost or feathery surface hoar and thick and thinner layers of small-grained near surface facets plagued the snow surface on many slopes before the Superbowl Storm. These are notorious persistent weak layers, and in some areas were buried intact, so the danger of avalanches failing on one will linger for a while. 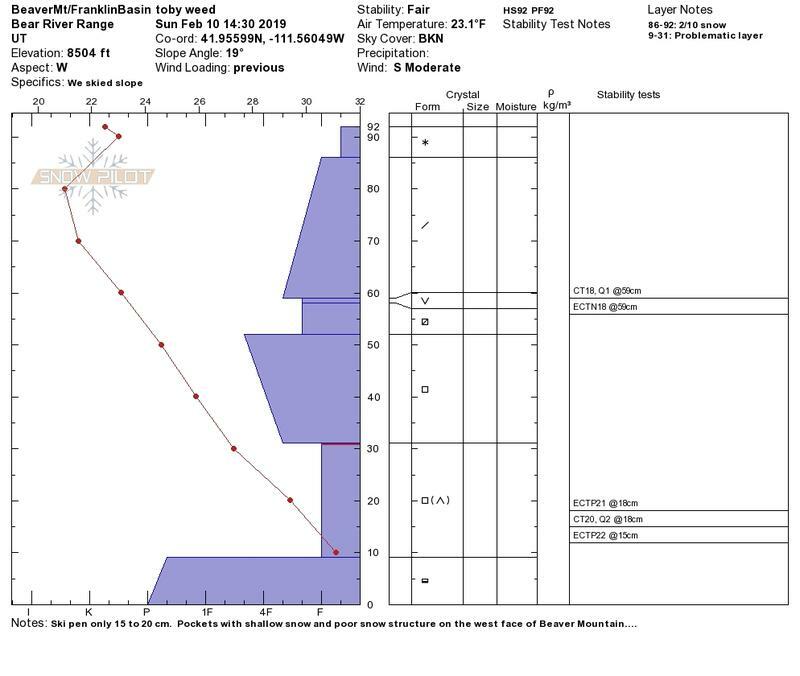 Recent storms added a good deal of weight to slopes with poor snow structure and increased the danger of avalanches failing on a deeper persistent weak layer. Buried layers of loose, sugary, faceted snow have been reactivated in some areas. 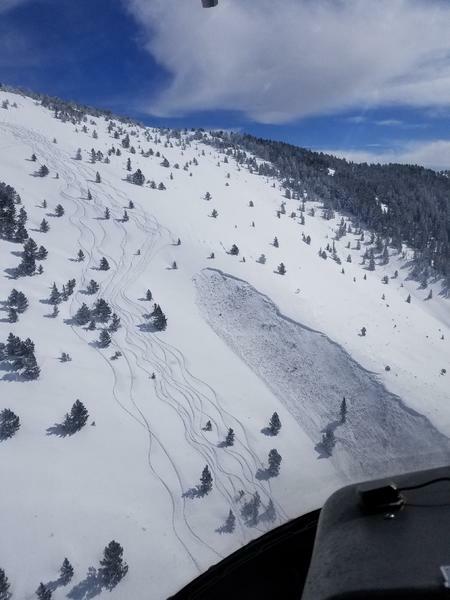 Dangerous, 2 to 4-foot-deep hard slab avalanches are possible for people to trigger, especially on steep, recently drifted slopes with poor snow structure. It is possible to trigger a deep hard slab avalanche from a thin area of the slab. In some areas you could trigger avalanches remotely or from a distance. I will update this forecast Wednesday morning.